Has another month just flown by? It is the 1st of October and it is time to share with you, and with Celia from Fig Jam And Lime Cordial what is new and exciting In My Kitchen October 2014. We ended up sleeping over at friends a few months ago, and when we woke up in the morning our hostess had a baking tray loaded with croissants for our breakfast. They come ready made and frozen before the second proving from a local bakery. I went out to buy a bag, and we have been enjoying these for breakfast over the weekends. I am going to perfect a recipe to make these at home, as the list of ingredients from the store bought croissants is not worth reading! In 2006 we were given a very second hand dish washer that has been slowly giving up its will to work. For the last 2 years we have had to turn the dial to advance it through various stages. A few Friday nights ago we had friends for dinner and I stayed up in bed reading waiting for the dishwasher to get stuck – it is quite audible. I did not hear anything and eventually fell asleep. On the Saturday morning I took the dishes out of the dish washer without really paying attention to where the dial was. It was only when I loaded the next lot of dishes in that I realized it had not quite finished the cycle. It did not get stuck but turned itself off. On the Saturday it switched itself off again without finishing the cycle and on the Tuesday it would not turn on. 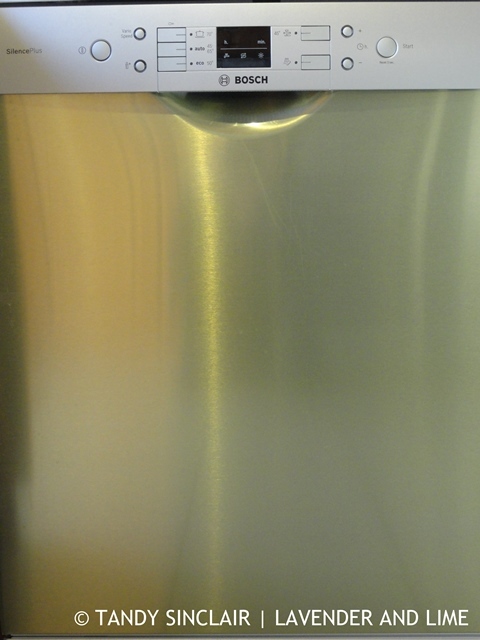 Not wanting to have to hand wash dishes over the weekend, Dave and I went to choose a new dish washer on the Thursday. I had two requirement – that the bottom level rungs could lie flat for pots and that it had a drawer for the cutlery. The Bosch met these requirements and have a few extra features that are fantastic, including a valve on the hose that will turn the water off if there is a leak! An exchange of gifts saw me taking home a dozen of this season’s duck eggs. I love them scrambled but I set 2 aside to make duck egg pasta when we had John and Dorothy over for supper. The duck eggs come from John’s farm so I thought it would be apt to feed him something made with the eggs. With much excitement I received my very own copy of Jerusalem. I made poached chicken the first night I got the book and the day after that I made chopped liver. This has to be the most amazing birthday present and it was sent from my dear friend Kim who lives in Perth. She shopped online with Yuppiechef and was most impressed with their service. This is why I think they rock! 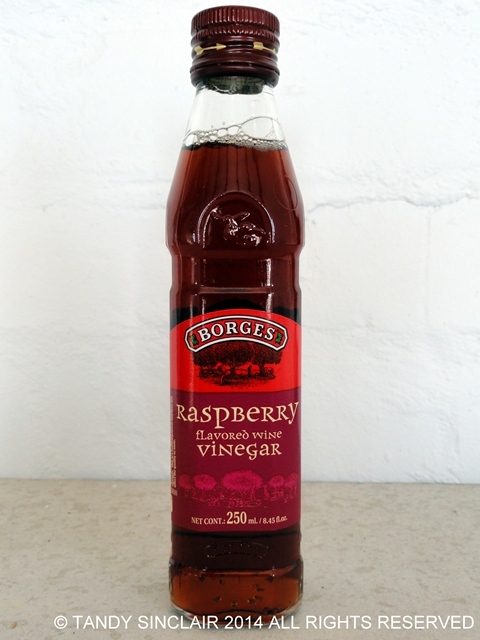 My obsession with vinegar continues and this month I got myself a bottle of raspberry vinegar – and as I opened it I could smell raspberries! I think there will be some raspberry pavlovas coming soon! 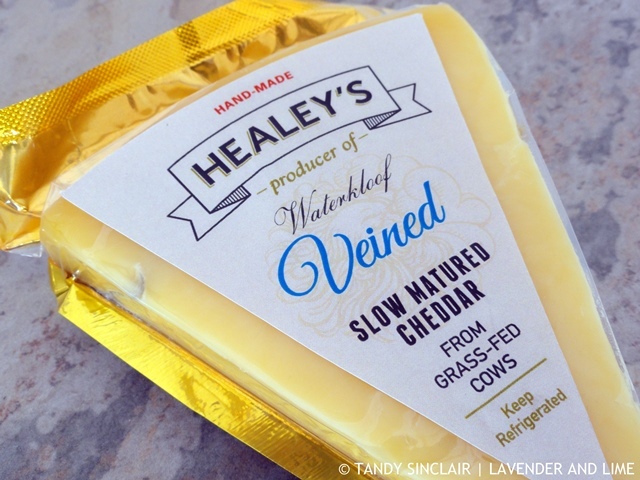 At the recent media event I attended at Waterkloof I was given a block of Healey’s Slow Matured Cheddar. This is an exclusive, raw milk cheddar made in limited quantities and aged for 12 months in perfect conditions. There are only 700kg of this cheese available and so far I have made my way through three of these blocks. Dairy cows are pasture fed in a specific pasture for this seasonal cheese which has a strong nutty flavour. The 3 week season runs from the end of September and the cheese is hand made and retails from the estate at R46 per 200g wedge. Dave and I are due back from France today. You can read our daily diary of our trip by clicking here. Hi Tandy, I’d be interested in knowing how you like the dishwasher. Our own is slowly giving up the ghost. We’ll need a new one soon. Hi Tandy! Funny to hear you mention Hermanos – I have CT friends who are looking for a property there! Jerusalem is wonderful! The meatballs with favas is excellent and their Ba’harat spice recipe for them is wonderful with so many other things too – I make up double the recipe to that I have some some on hand when I need it. Your dishwasher sounds great. I now know why the lower racks flip down and am very excited to try them out!! ( can you tell I didn’t read the instruction manual?) Ours was new with the property so I didn’t have to do any research on them…That cheese sounds fantastic – I am visiting CT in February so will look out for it. And those eggs – ooof! Wondeful in pasta – I am sure your guests enjoyed the dish!! I love duck eggs and was lucky enough to pick some up at a local market recently. Duck eggs make beautiful sponge cakes! Oh my, that dishwasher is lovely! I am envious right now because our dishwasher has been out of commission for two years (it broke itself) and we have yet to decide on whether we want to replace it or not. I suppose we don’t need it that badly, but having one with the rack for pots and pans and a separate cutlery box would be nice for the next one! I enjoy Jerusalem so much and am excited for you to get to cook all the wonderful recipes from that cookbook. One of my favorite recipes is the meatballs with fava beans. Delicious! Lots of great goodies indeed, I hope you can perfect your croissant idea- yummo! 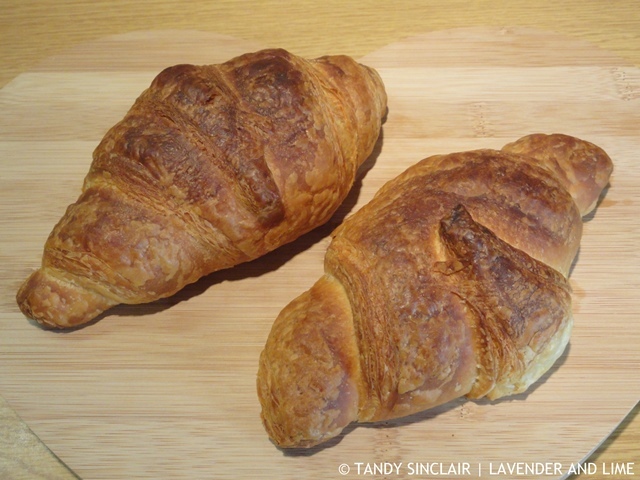 Croissants from the freezer to oven, sounds like a heavenly weekend treat! A new appliance is always fun, enjoy your new dishwasher! I know I barely survived the couple days mine was broken until hubby fixed it. You were the inspiration for me getting the book! Hiya Tandy… always such interesting things in your kitchen! Love Ottolenghi and his books! Peter and I are going to Sydney for one of his lunch events this month! 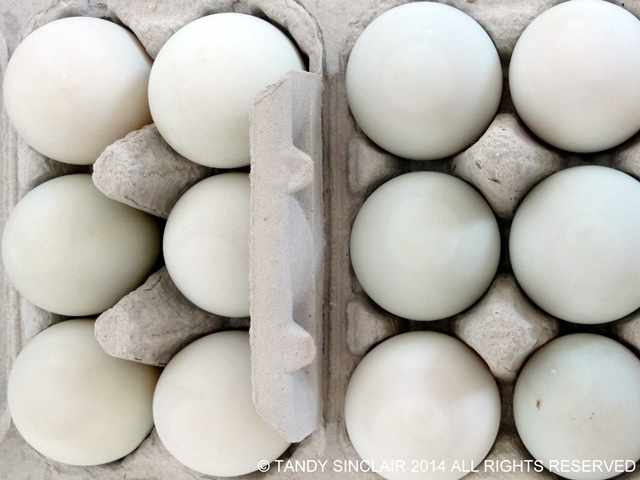 I have yet to taste duck eggs, but aren’t you lucky having such good access to fresh ones! Happy cooking. everything looks lovely in your kitchen Tandy. it seems that Ottolenghi is flavour of the month this month:) He is coming to Brisbane in Oct.and I am just trying to decide if i can afford the astronomical amount of money they want to have dinner and a talk by him.! Hope France was/is great. I would jump at the opportunity Sherry! Our dishwasher was getting very temperamental when we sold our house in SA, so we gave it away. Hope it’s still going. 🙂 I don’t think I’ve ever had duck eggs. Do they taste very different? So many wonderful things in your kitchen Tandy. Your new diswasher looks fabulous. I also have a Bosch but nothing as fancy and smart as yours. I would not survive without mine even when Pete is away and I am on my own. thanks for the peek into yout kitchen Tandy, you have me thinking about raspberry vinegar now! G’day Welcome back from France Tandy! I too love and maybe is an obsession with vinegars, but sometimes I simply don’t know how or what to do with them, so will look forward to your pav! I must remember not to read your blog posts just before lunch. Now I’m craving cheese and coffee! 🙂 Hope you had a lovely holiday, looking forward to reading about it. I read blogs before breakfast which is not always a good idea! I’m fascinated by the duck eggs. I’ve seen them in the supermarket, so I must try them soon. Another fabulous post Tandy! 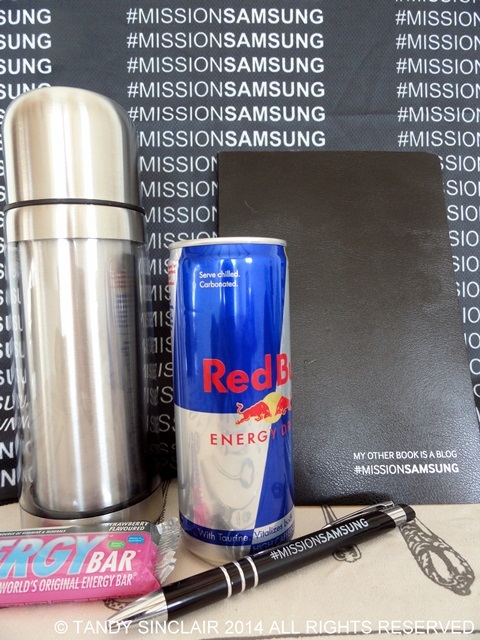 I love the notebook you received – my other notebook is a blog. We bought a new dishwasher earlier this year – its way of telling us it had to be replaced was by shorting out all the power in our house. It took me way to long to work out it was the dishwasher! And in Jerusalem make sure you make 5x the spice mix on p211 – it’s great on chicken and in burgers as well as on lamb, and the turkey burgers on p200 are easy and divine, with or without the sumac sauce. Welcome home. That cheese made me very, very hungry! I have to go and get some more next week! I am well pleased Rachel as I do not really like washing dishes every day!